We offer high quality, embroidered aprons and printed aprons with logo, all suitable for catering and hospitality staff. The personalised apron or pinny in its original, practical use is to protect our clothing from spills or accidents and can be spotted in every caterers business, on everyone from butchers to baristas. Over the years, aprons have become an effective way of delivering uniformity in a catering environment and when you brand aprons with logo, this gives you an additional, professional image. Banksford are specialists in branded hospitality and catering uniforms. 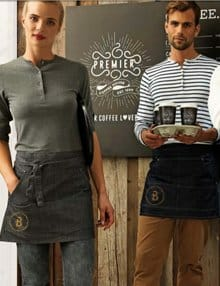 If you’re looking where to buy logo aprons as part of a uniform for your organisation, we compare a huge range of styles and materials, suitable for all occupations and events including cafe uniform, coffee shops, catering exhibitions, restaurants, gift industry and even gardening businesses. Our extensive range includes simple kitchen aprons, promotional, disposable, black, white, waist, bib, tabards suitable for ladies, men and a kids range. You can personalise aprons with embroidery or printing with your company logo, name or message in a few simple steps.